Project management can be messy, leaving employees frustrated. What if there was a better way to actually get stuff done? There’s an easier way to manage projects: Microsoft SharePoint. Here’s the top 10 reasons to use SharePoint for project management. Implementing SharePoint for project management can be complex. Here’s what you should know before using SharePoint for project management. Tired of managing projects by email and Post-it® notes? You need a project management hero. Project management shouldn’t be rocket science. Why was I even copied on that lengthy email? Am I missing something? Who’s assigned to that task? Are they done with it? Is anyone even holding them accountable? Where’s that file I need? I see outdated email attachments. Guess I’ll have to log into 3 other systems to try and find it. What’s the status of the project? What’s the updated deadline? What’s the next step? Are we over budget? Has billing been properly handled? Getting stuff done would be a lot easier if you didn’t have to deal with long, confusing, and outdated emails, Post-It notes, whiteboards, Excel, unnecessary “planning” meetings, and 17 other project management tools. Imagine if there was a single tool that could simplify project management for you and your team. It would natively integrate with Microsoft Office. It would show a customizable dashboard to give stakeholders the exact metrics needed to get the job done right – on time and on budget. Better yet – imagine if you probably already own (and pay) for it. Why Use SharePoint for Project Management (PM)? *Cape not included. You’ll be the hero that made project management easy with SharePoint. By using Microsoft SharePoint Online (part of Office 365 – which you likely already have), managing projects will be simple. You can customize it based on your current approach to PM (such as Agile project management – APM). ✓ Stuff will actually get done. ✓ Central hub: One system will have everything. ✓ Dashboards and reporting keep stakeholders in the loop. ✓ Timelines and budgeting will be based on actual data (including from other systems). Project resource management and inventory tracking will be simple. ✓ Progress updates and deadlines will be clear. Milestones will automatically be recorded. Everyone will be on the same page. ✓ Task management, assignment scheduling, and accountability will be simplified. ✓ Documents will be organized. Finding the right file or template will be as simple as searching Google. ✓ Collaboration will be efficient (anytime, from anywhere, on desktop or mobile). ✓ Financials for the project will be easy to see. Check estimates versus actual expenses. Sort, aggregate, filter the data. ✓ Familiar interface: SharePoint intuitively ties into desktop, email, and calendar workflows in Microsoft Office. ✓ PMOs will love it: If your company has a project management office (PMO), they’ll become more efficient. Employees love SharePoint much more than using a million different tools for one project. Did we mention that you won’t need to be pestered by employee questions that you’ve already answered? And your boss will be happy, because they’ll be able to quickly see progress in a real-time way (see sample work log dashboards), not relying on outdated reports from an export. In fact, everyone will be looking at real-time data from the same place. SharePoint can even predict when your project will be finished. Yep, it’ll make your job easier while saving the company money. Implementing SharePoint without a strategy is about as fun as running with a laptop on fire (which we don’t recommend). Unfortunately, you only get those benefits if you properly implement SharePoint and integrate it with other company systems. Out of the box, SharePoint isn’t configured to your organization or integrated into your other business systems. Sure, you could try it on your own, but it’s not as easy to properly set up as you might think (or as Microsoft wants you to think). Many of your initial decisions have key implications that aren’t possible to change down the road (such as structure, theme, and naming conventions). A lot of our customers come from businesses that are struggling (or completely stuck) with configuring SharePoint to meet their needs. SharePoint can be tricky to set up in a way that works seamlessly for your specific organization. Benefit from our experience. We’ve migrated over 200 companies to SharePoint and set up over 50 SharePoint project management systems. Here’s what SharePoint looks like “out of the box”. You’ll have to do a lot of configuring to make it work for your business. Or, you could hire an expert (like HingePoint) to help. If you go it alone, know ahead of time that you will need to build and customize the following. Plus, many of the initial choices you make when setting up SharePoint for project management are irreversible. In fact, SharePoint is going to fail as a project management system if you aren’t careful and strategic about how you set it up. Contact Us » Why HingePoint? With over 15 years of experience, we have done over 50 project management systems and have helped automate large portfolios of projects (from hundreds to thousands of them). We’ve helped over 200 companies migrate to SharePoint. Our unique process ensures you’ll effectively use SharePoint for project management. We don’t provide cookie cutter solutions; your situation needs a custom solution (which is what we provide). We are the only company in the industry that offers a results-based guarantee. That’s how confident we are that you’ll benefit from switching to SharePoint for project management. Verizon automated 500 projects across the country with SharePoint, integrating 5 systems for a project management dashboard with a 7X ROI. 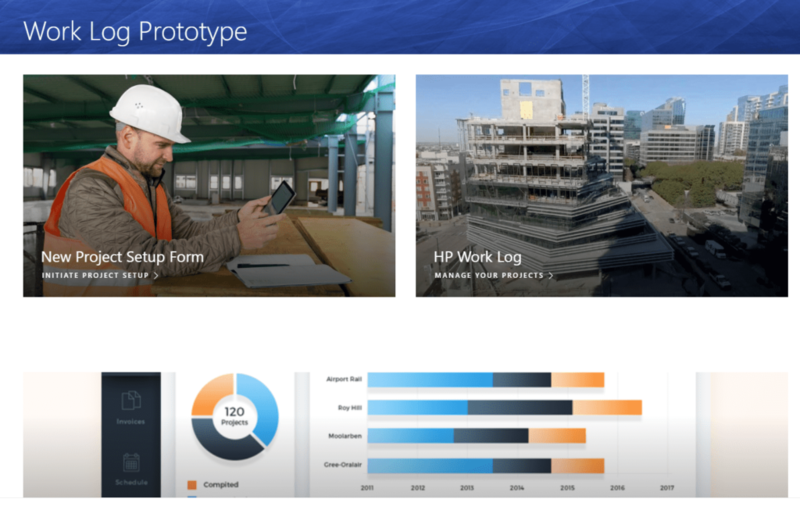 Marriott Architecture & Construction goes mobile with SharePoint for field construction documents on iPads, potentially saving 100’s of hours per hotel construction project with a 15X ROI. Gordon Highlander needed a Construction Work Log in SharePoint to bring visibility to the status of all projects. This reduced project management effort from 28 to 12 hours per project, for 240% increase. Chick-fil-A integrated SharePoint for construction projects with Autodesk and asset management systems to renovate 4,000 restaurants, creating one system out of 3. 400X ROI. Find a SharePoint expert who will customize SharePoint to meet your needs and that can integrate it into your other business systems. Roll out your vastly-improved method of managing projects and documents. Watch the video demo now and read on below to see the Step-by-Step guide (with screenshots) demonstrating how to use SharePoint to manage projects. This article walks you through a live demo of the HingePoint Work Log. It can be used to log and track projects for an entire company. You can track and manage all your projects in two SharePoint list (database). One list is for New projects in Sales and once the project is approved it is moved to the second list for Active Projects in a Worklog. We like to create a nice SharePoint site for the users, so they have a good place to start and manage the entire project life cycle. For example, at HingePoint on our intranet home page you can access all the information you need on the job. See the link Icon to the HingePoint Projects that goes to the Project Dashboard. On this project home page, you can access all the tools and data you need on the job. We use a SharePoint Communication Site template (in this case) with access to the New Project Set Up Form and data list, as well as access to the Worklog SharePoint list and we also have dashboards built on top of the SharePoint data accessible here. You arrive here where this screen shot shows the backlog of projects pending form sales. This can be used to plan team resources and who will be working on what projects in the future. SharePoint is an amazing tool for automating the workflow between roles in a team, department, or between companies or clients. SharePoint can send a “notification” email to anyone you want when you “trigger” that notification within SharePoint. In this video demo, Sales sold a project and wants to notify operations that there is a new project. So you will see a series of emails to people to keep them informed and give them the needed information for them to pass the baton like a relay race. If we check my email inbox you can see I just got a new project notification request for your input. This is basically an approval email that is coming from the sales team manager because he’s the one who owns the workflow so a new project has been booked and the operations team needs to know about it. The sales and estimator can meet with the project team to go over all the information on the job and collaborate on project planning. From this screen the operations manger can assign key resources to the project. We show here how to hand-off and assign a Project Manger, Senior Manager, and Super Entendent. As you assign people they get this email notification automatically. Now the Project Manager can see all the data they need about the project, as well as the date it was logged and then you can enter your budget, forecast and actual hours, etc. If they click the link in the email, they go straight to the source of the information in SharePoint so everyone is on the “same page” with project information. We set up a workflow that will notify the team members by email if there are any edits to the project information. This keeps everyone in sync to the most up-to-date information and cuts back on having team meetings. The below screen shot shows what the link in the email goes to (a screen of all the project information in SharePoint). Need help with SharePoint? Our expert SharePoint consultants, developers, and integrators can make it easy. Contact us today! Customizing SharePoint is complex and exhausting. Wishing for a better way? We can help. Our expert SharePoint consultants, developers, and integrators can make it easy. Contact us today! HingePoint’s custom SharePoint consulting, development, and integration services have helped many companies eliminate the pain caused by other project management system. Those same customers have transitioned into a more organized, productive organization through automated workflows and easy-to-search information.